First have started to put up details for the service changes due in April. Most of these changes are down to retendering by Cornwall County Council but there will also be a few timetables altered within Plymouth, details though have yet to be put up by First. I wont put the whole list for Cornwall here as it is a bit outside of this blogs remit and it is quite a big announcement. See the link below for the full list. Following the successful award of a number of tenders to First by Cornwall Council we are pleased to announce a number of improvements to the network operated by First in Cornwall. There are also a number of other changes to First services in Cornwall which have been made as a result of changes to funding arrangements in the County. Plymouth to Callington continues to run every hour on a revised timetable. Journeys from Callington retimed to 5 minutes past each hour and most journeys from Plymouth retimed to 25 minutes past each hour. Journeys extended to/from Bude approximately every 2 hours. The timetable for this service has been revised in order to take into account the changes to the ferry timetable on Fridays and the outcome of the Cornwall Council tendering process. Service 81C will now only operate as far as Insworke Quay with 4 journeys operating via Crafhole and Sheviock to provide links to Plymouth. Most journeys from Insworke will operate as a through service to Plymouth using the same vehicle. The section of route between Plymouth City Centre, Peverell and Derriford is withdrawn. Passengers using this section of route will need to changes buses and use service 15 or 83 (Peverell)/84/86. The timetable on Sundays has been revised to offer better reliability and capacity at busy times. First will continue to provide the journey from Insworke to Torpoint School, all other school journeys will be provided by alternative operators. The 581, 582 – Cornwall Council has terminated these contracts. A big thank you to all our passengers who have used these services whilst we have been running them. The 593 - Timetable unchanged but will no longer run into Bretonside, and buses will start and finish above it in Exeter Street. 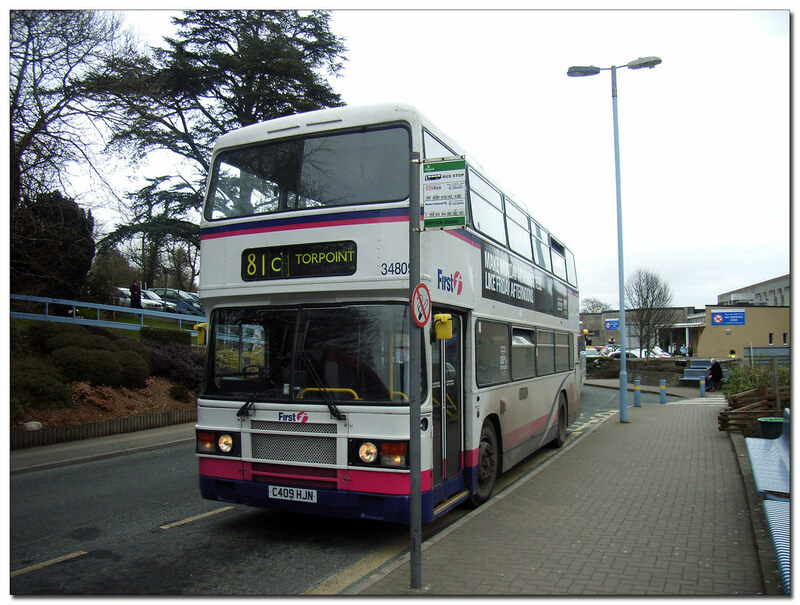 Its sad to see the Derriford extension of the 81C finally come to an end but I cant say I am surprised. Actually I am surprised it has lasted as long as it has. It is also interesting that First and Western Greyhound continue to compete on the Plymouth – Launceston route. Seems so long ago (2008)- an Olympian on the 81C. Interesting how Western Greyhound have stopped using Bretonside. I wonder what their reason is for using the viaduct instead? What about th 1/1A changd? I noticed that the 81/81A is shown as terminating at either Torpoint or HMS Raleigh in the 'forthcoming timetables' section on the First website; timings are shown to Insworke. Will there be no buses serving Cremyll Ferry? Also Western Greyhound seems to be abandoning St Austell Rail Station ... so much for integrated transport. The changes to the 81A are purely because of the re-tendering of the route by Cornwall Council. First are only the contractors so have to run the timetable provided. The council chose to split the route in this way, it does seem a little odd to me but then what to I know. There are alot of timetables being altered in this round of tendering. Also Anon - Western Greyhound are not using First Devon & Cornwall run bus stations, partly because of the departure charges. As for integrated transport in St Austell most bus passengers only go from one bus to the other, they can continue to do this at South street and Trinity Street. First do not headline their Sunday timetable as running to Cremyll until you click on the Sunday link. Re 'integrated transport', what about people alighting from a train and wishing to get a bus from St Austell. What hope for those holding a Plusbus ticket who are told that the "Interchange station(s):St Austell (Station Yard bus station)"? It's a bit of a steep walk, especially coming up from the town. First have got their new timetables posted on website for 1/1a (Saltash) and 5 (Mount Gould) Does not seem to be a lot of difference to the pre April Timetable ?? Certainly no major cuts at all. I've noted the new timetables - will try to see what the difference is - cant see anything so far! For the 1/1A. They have added 2 minutes in Saltash.